Have you seen a fisher, or sign of one? Be a citizen scientist of the Moraine Mesocarnivore Project and let us know the date, location, and type of fisher sign you have seen around Central Alberta. See the below map for current citizen science sightings! Fisher are native to Central Alberta, but their distributions drastically shifted after the fur trade. This has resulted in them being listed as a species of special concern in British Columbia, and unlisted in Alberta. To get an idea of where fisher are occurring both within and around the Cooking Lake Moraine, the Mesocarnivore Project is asking for your help with sighting signs of fisher. 3. Fisher are a common roadkill species. If you discover a fisher carcass, and are willing to take a DNA sample from it, we would greatly accept this sample for DNA analysis. 1. Snip off a piece of muscle or skin from the carcass. 2. Store this sample in a small plastic container with alcohol covering the sample. 40% vodka or another alcohol will preserve the sample for several days. 3. Keep the sample cool in a fridge or freezer if possible. 4. Contact Frances for shipping information. 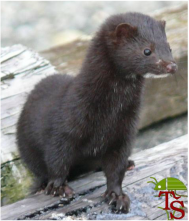 Fisher are a 2 - 6kg weasel with dark brown fur. 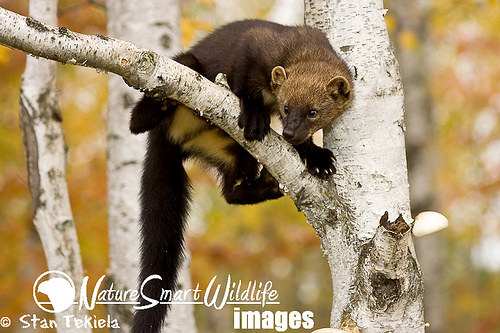 They are also known as the "pekan" or "fisher cat". Despite their name, they do not fish but instead are generalist eaters that mostly consume porcupine, snow shoe hare, small mammals, and some berries. They are shy and elusive, partly live in trees, and prefer old forests with good ground cover and fallen trees. Watch for their tracks in areas with lots of snow shoe hare - fisher are known to follow snow shoes hare tracks in an attempt to get a tasty meal. 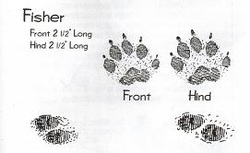 Fisher tracks are commonly found in two-foot bounding patterns. If you find a skull and think it might be from a fisher, take a close look at the "fin-like" bone that arches across the top - this interparietal arch is especially large in males. Fisher commonly climb and den in trees. Keep your eyes up! 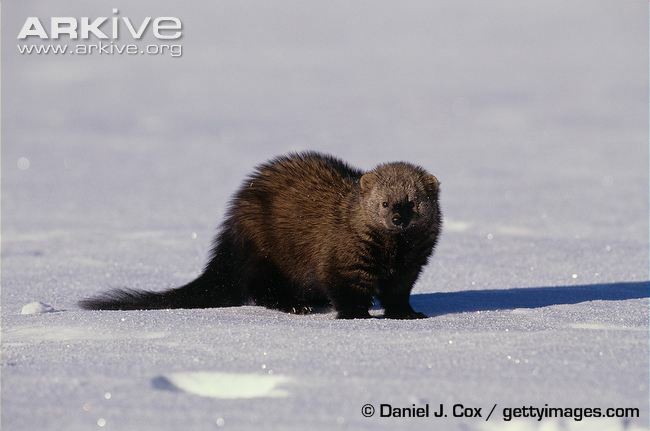 Fisher can be confused with a few other weasels, commonly the pine parten (Martes americana) and mink (Neovision vision). 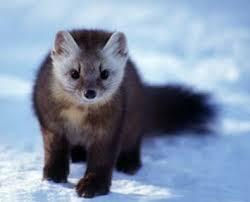 Note that the marten has a lighter chest patch and pointy ears. 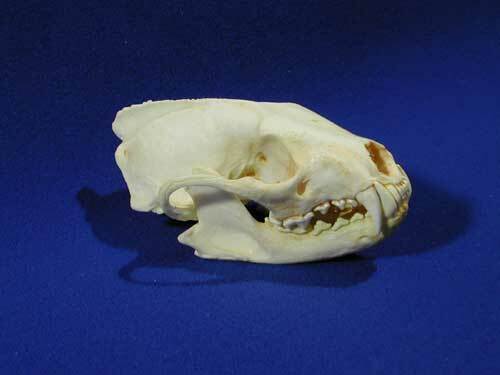 Mink are much smaller than fisher (1-2kg) and are generally found near water. This KMZ file opens in GoogleEarth to give a map of our current fisher sightings. We are currently working on embedding this map into this website.